Well here we are at another week. Thanks for joining me here. I can hardly believe April is almost over. Yesterday I purchased a new cookie jar and today that cookie jar sparked a frenzy of kitchen re-organizing that was just so much fun. I’ll be posting about that later but for now here is a picture of what started the whole thing. 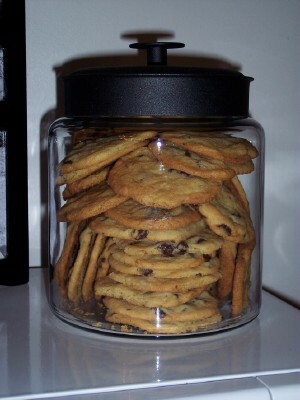 I’ve always wanted a clear cookie jar and I was so happy to find this one at Wal*mart. The chocolate chip cookie recipe I used this time is just the one from the back of the Hershey’s chocolate chip bag but this recipe I’ll be trying next! I’d also like to try this healthier chocolate chip cookie recipe as well but I can’t seem to find rapadura which I’m guessing is a sugar substitute. If you’ve got a favorite chocolate chip cookie recipe that you love I’d so appreciate it (as will my family!) if you linked to it in the comments for me. New participants can review MPM guidelines here. I am about to post my menu but wanted to let you know that Rapadura is actually REAL sugar in it’s natural form. It’s dried cane juice that has not been processed or refined or bleached, etc. I don’t know if you meant you thought it’s an artificial sweetener or not, but it’s not. It’s pure yummy goodness and it substitutes equally for white sugar (ie. 1 cup = 1 cup)!!! If you’ve ever been to the southern US and had a ‘chew’ of sugar cane, it tastes just like that! I will caution you that I have a hard time finding it. Even the national chain Whole Foods and Wild Oats never have it. Thanks Laura, I’m going to definitely keep my eyes open for it, it sounds wonderful! Hi Laura the baked chicken teriyaki sounds delicious..and the best chocolate chip cookie that we love is from cooks dot com. i’ll find the link and brb.. thanks for hosting everyweek..
Btw, sorry about double-posting in the Mr. Linky. I didn’t realize my title was the same from the Blog Giveaways. Hi Laura–we’ve had the best big fat chewy cookies that you linked to several times and love them. They are really, really good!! There is another recipe I like, but I’m not sure if it is online anywhere…I got it from my sister…who got it from her friend. I’ll have to see if I can find it. It uses pudding mix–very yummy!! Everything sounds great this week! Lots of flavor. Uses some whole wheat, but doesn’t taste like it at all. I hope this comment doesn’t come up twice, but it didn’t publish the first time. I love cookies and am also partial to white chocolate, so you can check out my recipe for White Chocolate Chip Cookies. (It is at the bottom of the post as a word attachment.) Enjoy your week. Not very imaginative, but it needs to be done. Missing out on a couple of weeks, turns everything to chaos. I looooove the picky palate site ! Doesn’t she have the best recipes ?! My daughter and I make these cookies, but regular-sized and without the pecans. We think they’re better than Toll House. Hope you’ll let me know what you think if you try ’em! Hey Laura! I’m back this week! Love your cookie picture- yum! Hope you have a great week! Here is my recipe, I love your cookie jar, I have always wanted one of them too. Looks like a great week… thanks for hosting. And not only do I have a menu up again this week, but I also posted links to some of the recipes I’ll be using! You posted chocolate chip cookies for me to look at when it’s only 8:30 in the morning! I try so hard to not each chocolate until at least 10:30. But I know I have some Hershey’s kisses downstairs! I moved Menu Plan Monday to my recipe blog, along with links to all my GF and healthy living favorites. I was so hoping to win a blog makeover in the bloggy giveaways, but meanwhile, I am playing around with some blogger templates to see what I like best. Happy end of April! Nice cookie jar. I have a retro McCoy I swiped from my mom when she and my dad split up. It took her years to notice I had it. Your plan sounds delicious!!! I just posted mine and I kinda want to just scrap it and eat what you’re eating. Have a great week & thanks again for hosting MPM. They are actually oatmeal chocolate chip cookies, but still delicious and easy. I’ve been thinking about baking chocolate chip cookies, too. I think I’ve been inspired to do so this week. I’m still trying to use up some of the excess in my pantry and freezer so my menu is rather uninspired this week. Some warm-from-the-oven cookies just might give it the boost it needs. I posted a recipe (this weekend) that I came up with for oatmeal cranberry chocolate chip cookies.. I just called them “Loaded Oatmeal Cookies” though. It’s a little different than regular chocolate chip cookies but they we’re so good! I even used part whole wheat flour in them! 🙂 Here’s the link! Yummm…looks like a very tasty week at your house. I’m going to have to try the Bacon Fettucini recipe, and I can’t wait to browse more at the Picky Palate site! Thanks! Your menu looks great! And your cookies look quite yummy. I’m skipping out again this week because I cannot figure out what to make with apple sauce, cereal bars, and diet coke. I found your blog last week during the Bloggy Giveaways, and can’t wait to spend more time here! My family knows just how organized I prefer to be…it scares them sometimes! Do I like that they have shortning instead of butter? No, but gosh darn they are good and soft and my favorite cookies that I know will be eaten by my kiddos and their friends. http://www.cookiemadness.com has a whole list of great cookies, I highly recommend her blog! This is my first week joining in on MPM, I found you through Laura at HeavenlyHomemakers. Your cookie jar is beautiful and the cookies look delicious. I think I will be mixing up a batch soon. Although I’ve tried many others, I can’t help but love the recipe on the back of the Nestle Tollhouse chocolate chip package. I’m trying out your pizza dough recipe this week! Those cookies look to GOOD!!!! I have a weakness of chocolate chip cookies.. Thanks for hosting this. It’s so fun to see what other families do. I’m joining in for the first time. Laura, that Baked Teriyaki Chicken is really delicious, but SO sticky! I would strongly suggest lining your pan well with foil so that you don’t have to scrub out the baked-on sugar. It’s worth the clean up, though. Hello! Just wanted to let you know I’m joining Menu Plan Monday for the first time. Your menu as always sounds great. I keep cookies or cookie bars always in the island cookie stand for the family. They disappear so fast. But the family loves it. I’m doing freezer meals again this week. Didn’t have time to do my entire week plan but at least I have 3 meals waiting for my week. I am new, and trying this out for the first time. My sis in law introduced me to it, and, well, it doesn’t seem to be a fad with her, so I am going to give it a try. Thanks for putting this out there.